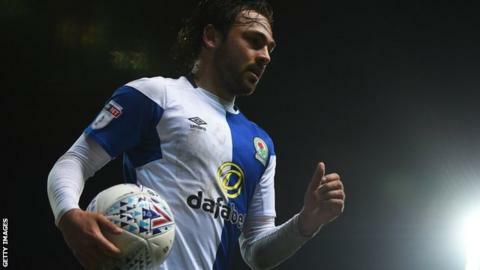 Bradley Dack scored two and assisted two as Blackburn thrashed League Two side Carlisle in the first round of the Carabao Cup. The Championship side took the lead after just two minutes when Dack set up Adam Armstrong before he pounced on a goalkeeping mistake to score his first. Dack added a second with a superb strike from distance after Hallam Hope had scored for Carlisle. Kasey Palmer then made it four before Armstrong scored his second. Armstrong - who signed a permanent contract with Blackburn this summer after being on loan from Newcastle United - took his tally to 11 goals in 23 appearances after Dack's fantastic through ball made it five to Rovers. Dack has now scored three goals this season as he continues his form from 2017-18 which earned him League One's Player of the Year accolade. Carlisle looked hungry for a comeback in the first half but Hope's excellent 30-yard effort was quickly wiped out by Dack's second goal. Macaulay Gillesphey and Adam Campbell also came close, hitting the woodwork on both occasions, but Blackburn continued to dominate in the second half despite making changes. Match ends, Carlisle United 1, Blackburn Rovers 5. Second Half ends, Carlisle United 1, Blackburn Rovers 5. Corner, Blackburn Rovers. Conceded by Joe Fryer. Attempt saved. Dominic Samuel (Blackburn Rovers) right footed shot from a difficult angle on the left is saved in the bottom left corner. Attempt blocked. Jerry Yates (Carlisle United) left footed shot from outside the box is blocked. Attempt saved. Adam Campbell (Carlisle United) right footed shot from the left side of the box is saved in the centre of the goal. Attempt missed. Richard Bennett (Carlisle United) right footed shot from long range on the left is just a bit too high. Corner, Carlisle United. Conceded by David Raya Martin. Attempt saved. Adam Campbell (Carlisle United) right footed shot from the centre of the box is saved in the bottom right corner. Attempt saved. Jamie Devitt (Carlisle United) right footed shot from outside the box is saved in the bottom left corner. Tom Parkes (Carlisle United) wins a free kick in the attacking half. Foul by Jerry Yates (Carlisle United). Attempt missed. Dominic Samuel (Blackburn Rovers) right footed shot from the left side of the box is just a bit too high. Dominic Samuel (Blackburn Rovers) wins a free kick on the left wing. Kelvin Etuhu (Carlisle United) is shown the yellow card for a bad foul. Foul by Kelvin Etuhu (Carlisle United). Attempt saved. Jerry Yates (Carlisle United) right footed shot from the centre of the box is saved in the centre of the goal. Attempt missed. Bradley Dack (Blackburn Rovers) right footed shot from outside the box is close, but misses to the right. Attempt missed. Jamie Devitt (Carlisle United) right footed shot from outside the box is just a bit too high. Attempt saved. Bradley Dack (Blackburn Rovers) right footed shot from outside the box is saved in the bottom right corner. Attempt saved. Dominic Samuel (Blackburn Rovers) right footed shot from the right side of the box is saved in the top right corner. Richard Bennett (Carlisle United) wins a free kick on the left wing. Foul by Peter Whittingham (Blackburn Rovers). Attempt blocked. Craig Conway (Blackburn Rovers) left footed shot from the centre of the box is blocked. Corner, Blackburn Rovers. Conceded by Gary Liddle. Foul by Adam Campbell (Carlisle United). Bradley Dack (Blackburn Rovers) wins a free kick on the right wing. Corner, Blackburn Rovers. Conceded by Tom Parkes. Bradley Dack (Blackburn Rovers) hits the bar with a right footed shot from the right side of the box. Attempt blocked. Dominic Samuel (Blackburn Rovers) right footed shot from the centre of the box is blocked.